In some sense man is a microcosm of the universe; therefore what man is, is a clue to the universe. We are enfolded in the universe. We are a microcosm of the universe. It is an ancient axiom which we cannot reasonably deny. We are products of our environment and our thoughts, words, actions, habits and character unfold our destiny (Lao Tzu, Mahatma Gandhi, et al). Yesterday we attended an Ethical Funds presentation by NEI Investments hosted by Meridian Credit Union at Cutten Fields in Guelph, Ontario. The talk was given by Robert Walker, Vice President, Ethical Funds & ESG Services, NEI Investments. What struck us during the presentation was the rise in Socially Responsible Investment (SRI) and Environmental Social Governance (ESG). The terminology we use at PeapodLife is Social Environmental Economics (SEE) as it relates to different aspects of the business process: SEE Valuation, for instance. The logical goal of companies operating under an ESG framework is, after all, to affect macrocosmic change (positive changes beyond the narrow scope of shareholder value; one might say shareholder values, where values denotes something quite beyond material gain, called SRI or SEE in our terms). Affecting macro change is difficult. No doubt about it. It is highly complex and impeded on all sides by innumerable competing interests. This is why nature does not affect macro change. It does not, and we see time and again in nature: fractal geometry, chaos mathematics, and biology. Nature perfects micro changes, then relies on intelligent application of those changes along an escalating framework of infinitely complex cause and effect relationships, called chaos by some. Why can’t companies tap into the same natural process, on which the entire fabric of nature is based? 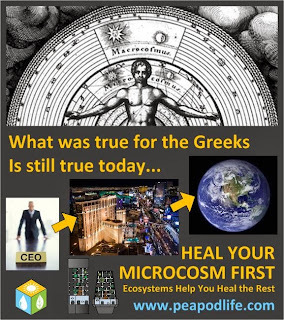 Using rainforest ecosystems to heal the microcosmic environment in which they work, CEO’s, their managers and employees will immerse themselves in the calming yet invigorating and inspiring energy field of a high-order ecosystem. Our ecosystems are designed to support the highest expression of all beings that are a part of them. When we are in their proximity, we count as members of said ecosystem. The ecosystem is intelligent. It is self-regulating, largely self-supporting, and most importantly self-organizing. It comprehends that its survival depends in no small part on the success of the human beings whose living/working environment it calls its own. To that end, it must support not just the physical and mental well-being of said humans, it also strives to create an emotional bond; literally, a space of love. How many great artists, philosophers, thinkers, scientists, designers, mathematicians, leaders, etc. have found inspiration in nature? We have taken for granted the scientific process at work. This is not just quaint anecdotal evidence or trivial coincidence. Nature seeks the evolution and highest expression of all its creatures: for all our posturing, we are still mostly intellectual animals. And yet, we have the profound potential to be so much more. We have the potential to allow a new, “bottom up” kind of process to take hold in a positive upward spiral of chaos. If our microcosm was a space of symbiosis and harmony, and we were a part of that energy field, it is that harmonic energy field which would influence our thoughts, ideas, behaviours, words, actions, habits, character, and destiny. Whereas until now, our industrial and post-industrial age has seen humanity live & work in largely toxic environments devoid of true natural expressions (and the macrocosm of the planet reflects this), we can begin changing the tide, quite rapidly, we might add, by making a dramatic shift at the microcosmic level in indoor environments of the movers and shakers: the leaders making decisions for companies, organizations and governments shaping the future of this humanity and the planet as a whole.